And some info about the Practice Section. 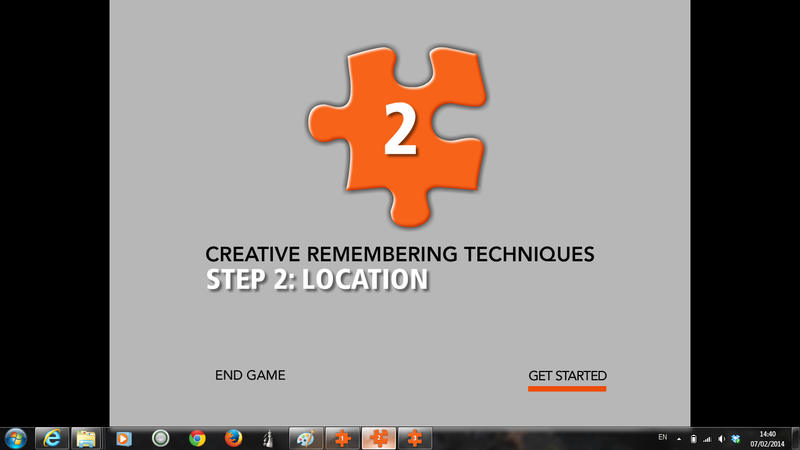 It is less a game but more a teaching aid, a training tool. To use so that you learn this step of Memory Training in a playful and relaxed and easy way. For illustration purposes I have included some screenshots. 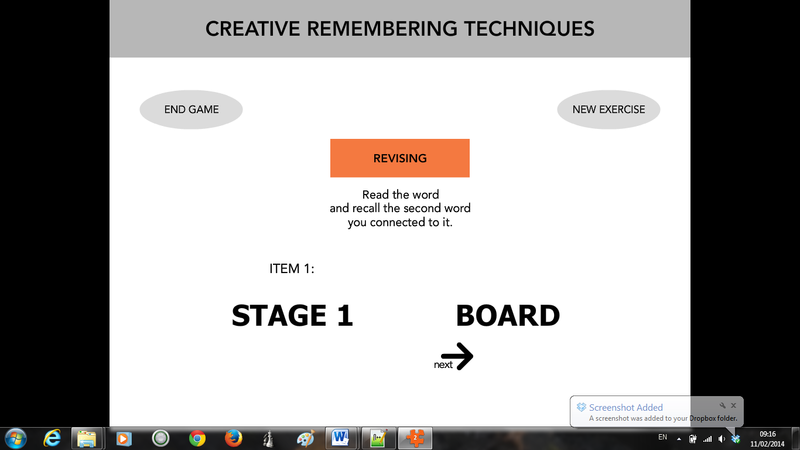 You will find a series of 10 slides; the word on the left says: STAGE, and this refers to the JOURNEY METHOD introduced in the theory section. 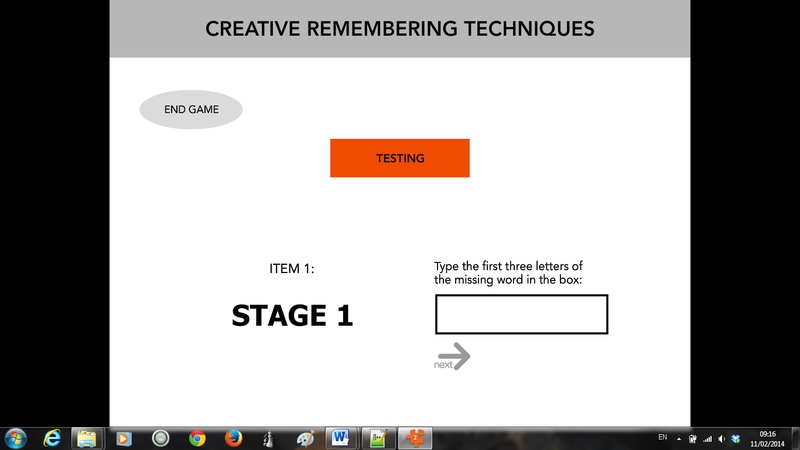 Connect your stage with the randomly chosen word on the right, as you have learned in the text section of Step 1: Association. You will find the same sequence, however the display of words is here in two steps. 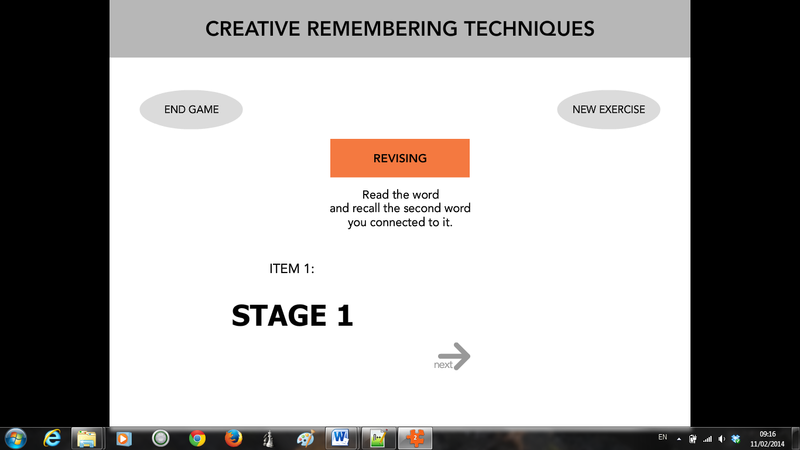 Revising means: Read the word STAGE on the left and recall = see this stage in your mind's eye; and experience the other word coming back, the one you connected to that stage. Should the connected word not come back, then you have the chance here to make the connection stronger. Only the word: STAGE will appear. On the right you will find some space to type (only the first three letters). After the 10th slide / set of words the RESULT page will automatically come up. Play the game as often as you wish. I believe you have achieved mastery of this step once you have 10 out of 10 three times in a row. After practicing a couple of times your average training time should be around the 2 minute mark. That is a good rule of thumb. That is good and ok and very acceptable. Should you have a competitive streak, then it is quite possible to aim for the one minute mark. Anything below that is the reserve of ‘olympic’ standard, and only for those who have too much time on their hands. If you get 10 out of 10: fine. 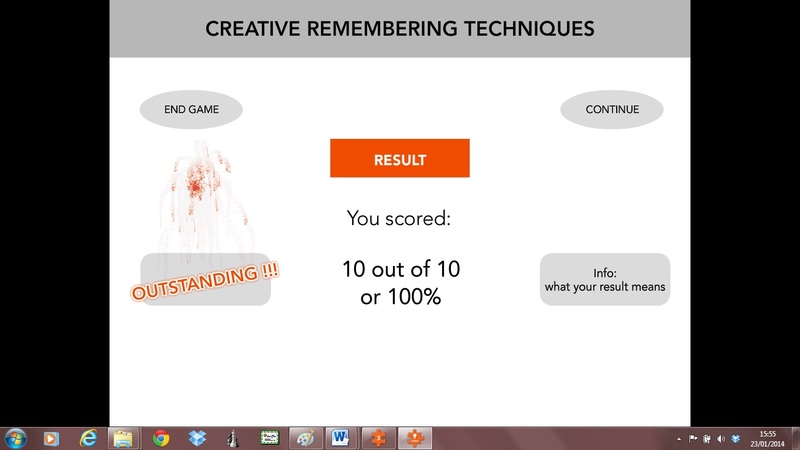 If you get 8 or 9 out of 10: Play again and see what happens.Most likely it was a lapse of concentration. Especially if you practice in the evening. That is ok; start again. Just like in the gym, you don’t run your best times every time. If you have regularly 8 or 9 out of 10: then your associations are not crazy enough.Read the theory part again, and do allow yourself to go into overdrive concerning the fantasy between the two items. If you have 7 or less out of 10: Please, please, please read the theory part. Especially the section that deals with when problems arise. If your problems persist (7 or less out of 10), feel free to contact me. And I mean it. You have made the decision to learn a new skill, and I will do my utmost to help you along the way. 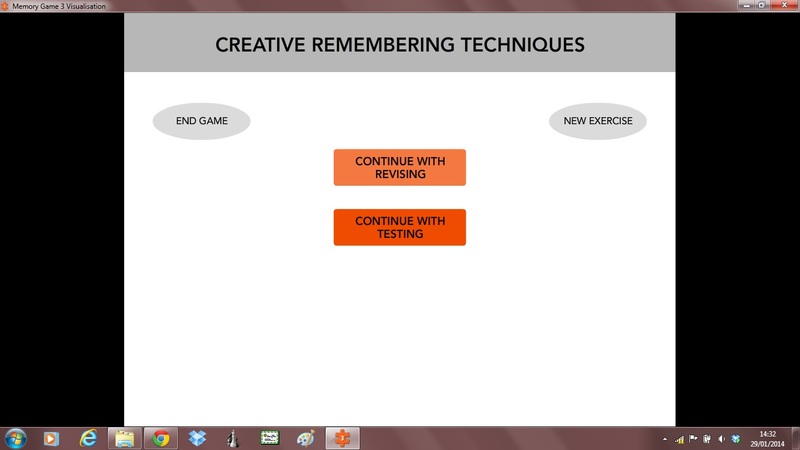 You will notice that you use the revision button less and less the more proficient you feel. My son usually wants to show off and refuses to use the revision button. It is a little bit like removing the safety net (of recall). However, should you be an auditory person, then you really will appreciate this revision cycle. What is an auditory person, you might ask. At the moment it is en vogue to talk about learning styles. And broadly speaking, students may be categorised as: visual learners or auditory learners or kinesthetic learners. Visual people take in most of the information through their eyes (= visual); they love pictures/images; auditory people love to hear lectures; and kinestetic people like to touch materials. Actually it is not necessary even to find out what style you prefer; however: the visual students are faster than auditory which in turn are faster than kinestetic people. In practice this means: Visual learners make stronger connections naturally, and therefore may skip the revision cycle sooner. Auditory learners simply need one revision cycle (more) than visual learners, and maybe the kinesthetic people might even appreciate two revision cycles. Nothing wrong here, that’s just the way the cookie crumbles. My own experience: I am an auditory learner. I have learned to make strong connections (like the visual learners); however it takes me a moment or so longer to recall the picture. I am solid in my remembering and recall, but I will never reach the speeds of visual learners. Ah, therefore competitions are not for me. Thank God, I don’t have a very competitive streak. It is a bit like learning running. In this analogy example: I can run; with practice I also did improve; quite nicely even. However I will never run the 10k in a competition. In analogy with memory techniques, here is one example: At present I can memorise a deck of cards in under 5 minutes; and with practice I will get it to under 3 minutes. I could be in the top 20 in the memoriad competition, but not in the top 10 (see www.memoriad.com). Well, that is just something I have to accept. However again: a deck of cards in under 5 (or 3) minutes, that’s not bad either, is it? 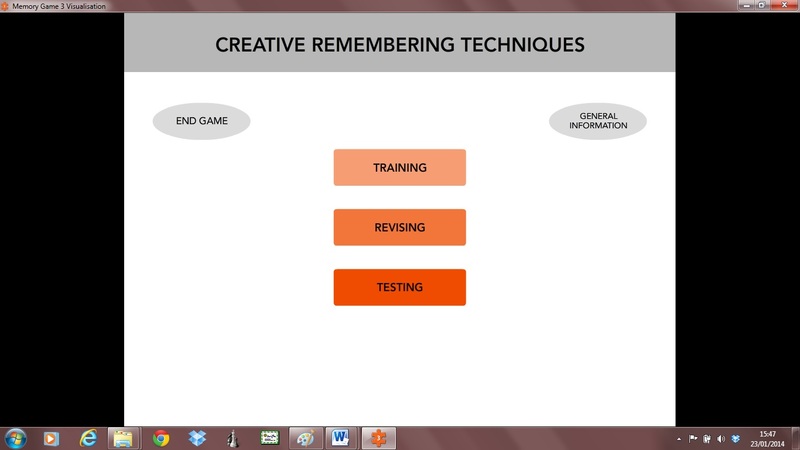 Learn how to organise your information how to remember items in correct sequence.